This is a practical, easy-to-use technique to discipline children. No arguing, yelling, or spanking is required. You needn’t be a saint, a genius, or a therapist! 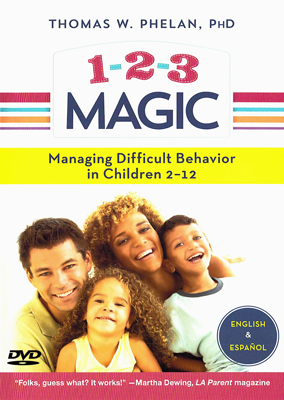 Manage troublesome behavior more effectively. Understand how silence speaks louder than words. 120 minutes. Closed captioning for the hearing impaired. English, Spanish. 2004. Dr. Thomas W. Phelan. This is a best-selling, award-winning discipline program. Your children get up and out in the morning, eat properly, go to bed when told, and pick up after themselves. 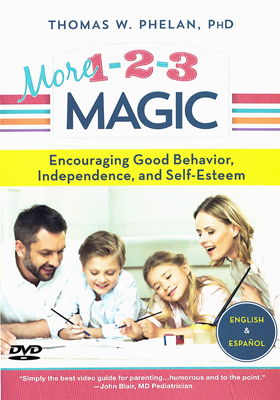 Learn how to encourage your child’s independence and promote self-esteem. 120 minutes. Closed captioning. English, Spanish. 2004. Dr. Thomas W. Phelan.